This isn’t another Kelly Bensimon post (see below). This is a sad teardrop in the form of a statement that slipped out of Iggy Pop’s cotton mouth. 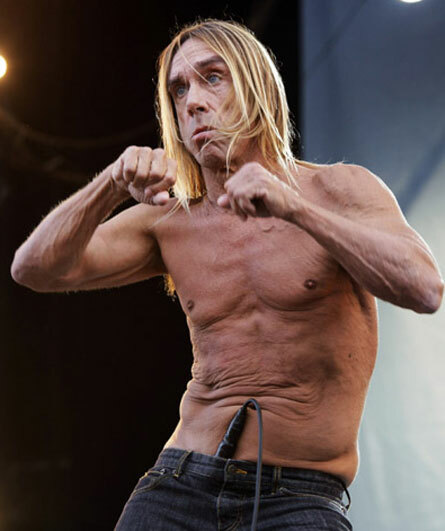 Iggy has announced that he is hanging up his stage diving days for good. Iggy made this decision when he landed flat on the floor after stage diving during a concert at Carnegie Hall recently. Nobody caught Iggy! More like, what the hell was the audience doing? Were they afraid that Iggy’s skin would come off on their hands like a slow-cooked baby back rib? That would never happen! Iggy’s skin was recently re-stretched. When Iggy jumps, you slather your hands in SPF 100, close your eyes, lift your arms and hope for the best. Poor Iggy. When will his turkey jerky torso ever smile again? Click here to see a few pictures from Iggy’s final dive.